This lovely ancient Russian Orthodox hymn, Agni Parthene, has a very Christmas feel to it. In keeping with today's scripture, it emphasizes Mary. Then Mary said, �Behold the maidservant of the Lord! Let it be to me according to your word.� And the angel departed from her. 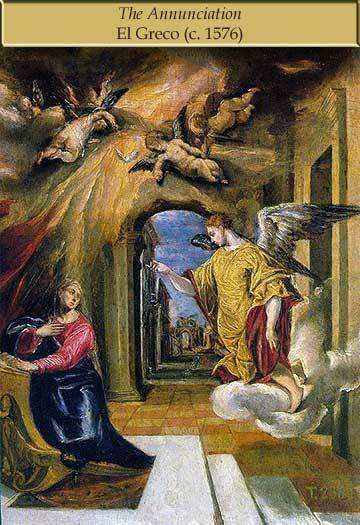 The passage today is termed "The Annunciation" and is celebrated as a feast day in many churches. The celebration takes place around the spring equinox (in Orthodox churches, it is always March 25 and is extremely important). The Gospels, however, place it directly before accounts of the birth of Christ, and so it is also, in terms of narrative structure, part of Advent. Another difference in emphasis between Catholic/Orthodox churches and Protestant churches is the degree of importance placed on the veneration of the Virgin Mary, especially in Orthodox churches, where Mary is known as "Theotokos", which is Greek for "the bearer of God". They place more emphasis on Christ's conception, as opposed to His birth, being the moment at which the salvation of humanity begins. I would like to take a minute to emphasize the fundamental principle of this website. Our emphasis is on the community of all persons who profess faith in Jesus Christ and His Holy Word. We try to be as careful as possible that all prayers, readings and statements will be helpful to, and usable by, all Christians regardless of denomination. How a person worships is a very personal matter; some Christians place great emphasis on the Annunciation as the moment when the Good News was first told; some place great emphasis on Christmas; and at the opposite extreme, the Pilgrims did not celebrate Christmas or even realize that it had occurred! And yet their core belief of this fundamental point is identical; God came to save humanity from sin in the person of Christ, who was born as a male baby named Jesus, to a betrothed virgin named Mary, "to the end that all who believe in Him should not perish, but have eternal life". I hope everyone who reads this page will join me during the Christmas season in celebrating the unity of all Christians; setting aside differences to emphasize the common beliefs of all who confess Christ to be their Savior.